In honor of his landmark research identifying the genes that cause deafness and its translation to patient care, Xue Zhong Liu, M.D., Ph.D., was recently honored with the Marian and Walter Hotchkiss Chair in Otolaryngology. From left, Edward Abraham, M.D., Alan Zhou, M.D., Wendy Liu, M.D. 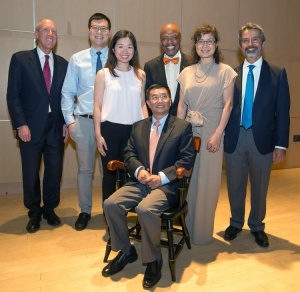 ’14, Xue Zhong Liu, M.D., seated, Henri R. Ford, M.D., MHA, Li Lin Du, Fred F. Telischi, M.D., MEE. Dr. Liu — an internationally renowned researcher, author, educator, and otolaryngologist — received the chair August 30 during a ceremony at the Lois Pope LIFE Center. Dr. Liu is just the second holder of the Hotchkiss chair, and leadership from the Miller School and UHealth – the University of Miami Health System were there to mark the occasion. The first recipient was Thomas Balkany, M.D. ’72, the former chair of the department and one of several mentors Dr. Liu credited with shaping his research. Fred F. Telischi, M.D. ’85, the current chair and another of his mentors, lauded Dr. Liu for his tremendous impact on the department, which has included training and mentoring dozens of clinicians and scientists, establishing a six-year resident research track, and coordinating the department’s renowned research enterprise. Dr. Telischi also congratulated Dr. Liu for his legacy of achievements, which have made a significant difference for people with hearing loss worldwide. Dr. Telischi also expressed his gratitude to the late Marian and Walter Hotchkiss for their generosity and foresight in establishing the endowed chair, which will play a vital role in furthering Dr. Liu’s cutting-edge research. Walter Hotchkiss was one of the first otolaryngologists in Miami. His wife, Marian, was a successful real estate entrepreneur who made several gifts to UM. Dr. Liu was recently awarded a $3 million grant by the National Institutes of Health (NIH). The grant will allow him to continue his research on human hearing loss — the most common sensory disorder, which affects more than 28 million Americans. Dr. Liu, who also received a $3 million grant to research hearing loss in 2017, is now the most successfully funded genetic hearing-loss researcher in the United States. Henri R. Ford, M.D., MHA, dean and chief academic officer of the Miller School, said Dr. Liu’s accomplishments are indicative of the pursuit of excellence that is synonymous with the medical school. Dr. Liu came to the Miller School in 2001 as a research assistant professor of otolaryngology. From 2003 to 2008, he completed his internship in general surgery and residency in otolaryngology at UM/Jackson Memorial Hospital and was made, a full professor one year later. He received a Doctor of Medicine degree in 1987 from the West China University of Medical Science in Chengdu, China, and a Doctor of Philosophy in Human Genetics in 1995 from the University of Manchester in the United Kingdom. He also pursued post-doctoral studies in molecular genetics at the MRC Mammalian Genetics Unit in the United Kingdom. While accepting the chair, Dr. Liu paid tribute to his research mentors for providing him the inspiration to pursue work in human genetics, including Walter E. Nance, M.D., Ph.D., former president of the American Society of Human Genetics; Andrew Read, Ph.D., founder-president of the British Society for Genetic Medicine; and Valerie Newton, M.D., Steve Brown, Ph.D., and Karen Steel, Ph.D., from England. He also thanked his wife, Li Lin Du, who works as a researcher in the Department of Otolaryngology; son, George; daughter, Wendy, a 2014 graduate of the Miller School, and her fiancé, Alan Zhou, M.D., who did his residency in dermatology at UM/Jackson.